Review Fix chats with Dead Synchronicity developer Luis Oliván who lets us know why the point-and-click adventure is a must-play this holiday season as well as why the genre still matters, as well as his goals for 2017. The game tells the story of Michael — a man with no past who must recover his identity and decode the two events that brought the world to the edge of collapse. The first is the so-called “Great Wave” — an inexplicable chain of natural disasters. The second is a pandemic that has turned humans into “the Dissolved” — infected beings with special cognitive powers whose sick bodies will eventually dissolve into blood. If Michael doesn’t hurry, he won’t be able to avoid the impending moment of “dead synchronicity” … when Time itself starts to dissolve. 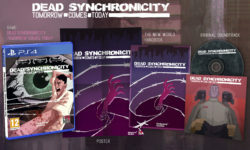 Featuring a script with dystopian overtones, Dead Synchronicity pays homage to classic adventure games such as The Secret of Monkey Island, Broken Sword, and Day of the Tentacle — with more mature themes along the lines of I Have No Mouth, and I Must Scream and Sanitarium. Solve each puzzle to get closer to the truth — guiding Michael to a future he may (or may not) be ready to face in this disturbing addition to the adventure genre.